Benjamin Bear is so impatient for Christmas to come. 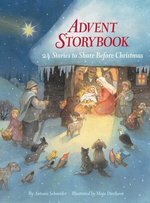 To help the time pass more quickly, his mother tells him that every day when he opens a door on his Advent calendar she'll tell him a story--""twenty-four stories all about another little bear and his long, arduous journey to Bethlehem. The little bear, led by a glittering star, meets many others on his travels across hot deserts, snowy mountains, and through dark, lonely nights. His adventures, filled with acts of heroism and kindness and many small miracles, show him the path to the Christ Child. And by journey's end Benjamin Bear--""and all youngsters who share the stories and their simple morals along with him--""will understand and celebrate the true spirit of Christmas.